"It takes nothing away from a human to be kind to an animal"
We're a husband and wife non profit voluntary team dedicated to the rescuing of our domestic animals. We have witnessed an increasing need in our local community over the last few years to, rescue, foster, and love unwanted, homeless, neglected and abused animals, be they domesticated or wild. Our rescue continuously strives to reduce the population of homeless or unwanted animals through promoting and supporting spay/neutering awareness programmes within our local community. We network with rescues nationwide to transport and place animals all over the country. We assess all of our rescued animals and ensure that the most suitable animal is rehomed with the most appropriate family for its needs. 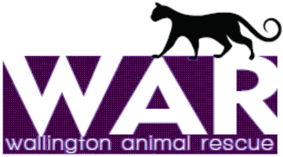 Wallington Animal Rescue provides these needed services through our ongoing fundraising efforts. We strive to raise awareness of the impact of abused, abandoned and homeless animals within our society. We aim to engage, involve and help to educate our local community about the ethical treatment of animals and their wellbeing in general. •To help and educate our local community regarding the welfare and needs of an animal and its ongoing care. 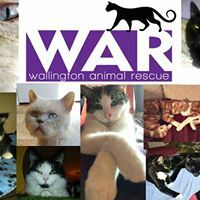 We have a strict no cage policy for cats and dogs unless there is a medical need for them to be on cage rest and so we rely on our amazing fosterer's to help home the animals whilst we look for their perfect homes, we also have specifically designed cat rooms for the cats that stay here at the rescue. The rooms have been designed to encourage fun and stimulation whilst giving the cats plenty of places to relax and feel secure. The group is specifically aimed at covering the communities of Wallington and Carshalton as well as nearby areas. It is run on Facebook so please pop over and join and share our page. The more people on there, the more chance missing animals will find their way home! Posts are limited to lost and missing animals. On the 4th December 2017 we were honored to be nominated for the 'Spirit of Wallington Awards' and we were blown away to win the category - 'Community Award'. Thank you to everyone who took the time to nominate us and for everyone who helped arrange the awards evening it was a fabulous event and we are so pleased and proud to of been a part of it. In November 2015 we were honoured to win an award in The Spirit of Wallington Awards. We are very proud to be an award winning animal rescue.